54973 Acting Bombardier John Caleb Richards, 44th Company, Royal Garrison Artillery died 18 September 1915 and is buried at Pembroke Dock Military Cemetery, Wales He is commemorated on the Etherley and Evenwood War Memorials and the Etherley Roll of Honour, St. Cuthbert’s Church, Etherley. He was 25 years old, the son of John and Mary Richards. The 1891 census details indicate that John senior was born at St. Martins, Salop (Shropshire) and Mary was from Wales. They lived at Long Row, Leasingthorne and he worked as a coal miner. They had 2 children, 2 year old George (born at St. Martins, Salop) and 1 year old John Caleb born at Leasingthorne, Co. Durham. In 1901, the family lived at Risehouse, West Row, Middridge near Shildon where father John worked as a coal miner (hewer) and his eldest son George (aged 13) worked on the screens. It is most probable that they worked at Middridge Colliery, owned by the Weardale Iron & Coal Co., either at the Eden Pit or the Charles Pit. In the 1890’s, a total of 420 men and boys worked at these pits but the colliery closed after the end of WW1. In 1901, John junior was still at school, as were his 2 sisters, Sarah and Mary. There was another son, Frederick aged 2 years. 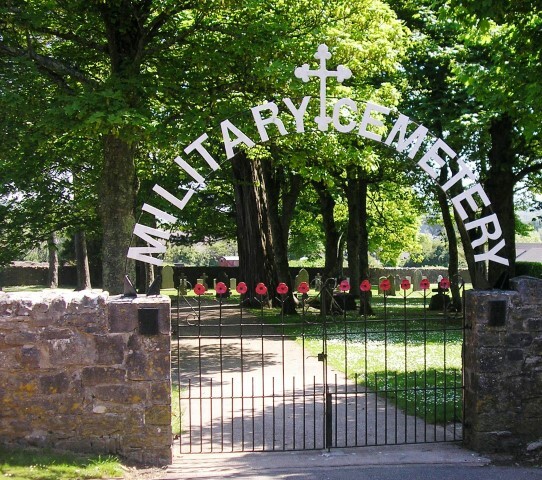 The service records for Acting Bombardier John Richards have not been researched but it is likely that he volunteered for service at the outbreak of war, served with the Royal Garrison Artillery and was posted to Pembrokeshire where there were fortifications protecting Milford Haven and the Royal Naval Dockyard at Pembroke Dock. These various activities kept the dockyard fairly busy for as long as the war lasted, indeed the work force rose to its highest ever to about 4,000. After the war programme only one more ship was launched, the Royal Fleet Auxiliary oil tanker “Oleander” in 1922. In addition, the light cruiser HMS Capetown having been launched elsewhere was towed to Pembroke for completion. After the war, the workforce was soon reduced by more than 50% and the dockyard finally closed in 1926. Innermost defences, the Defensible Barracks on the hill above the Dockyard and a Martello Tower at each end of the Dockyard Wall, with embrasures aligned along the wall. 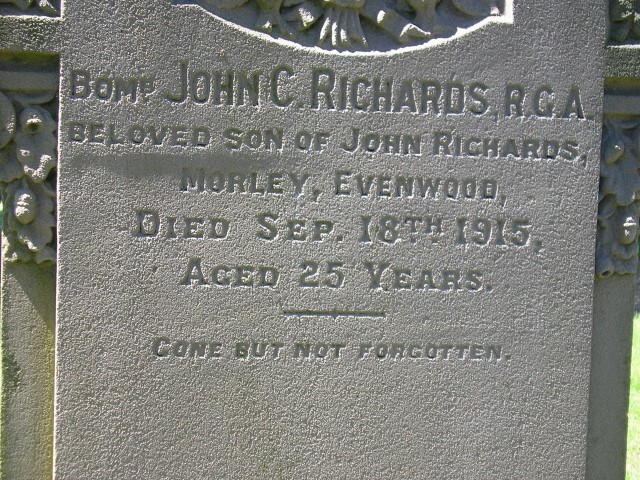 Acting Bombardier John Richards died 18 September 1915. The cause of his death is unknown. He should have been awarded the British War and Victory medals but to date the medal roll has not been traced. There is a short but well detailed account in a pamphlet The Fortifications of Milford Haven and Pembroke Dock by M.J. Wheeler, published by the Pembrokeshire Coast National Park Committee.